So maybe your doctor has told you you need to change your diet. Or maybe you are just trying to cut back on red meat. 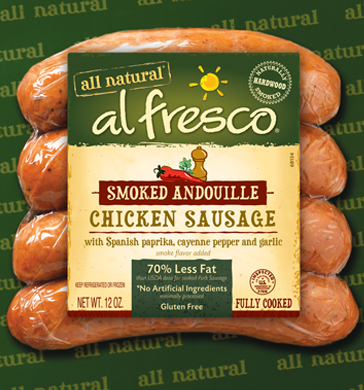 This doesn't mean you have to give up sausage - those lovely, encased ground meats and spices that burst with flavor. 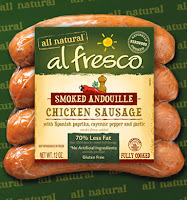 There is an alternative using chicken - the Al Fresco All Natural line of sausages and meatballs. Al Fresco contacted me asking if I would be interested in sampling their products by hosting a party. Unfortunately I have bad luck with throwing parties and I have had a very full schedule of late. Finally the opportunity arose when a friend decided to host a Mad Men finale party - potluck. "I'll bring the sausage dishes!" I told her. I made two dishes - Grilled Pineapple Appetizer with Teriyaki Meatballs and the Italian Chicken Sausage & White Bean Stew (recipe below). The meatballs were super easy. Basically cook the meatballs, toss them with Hoisin sauce, and add some grilled pineapple. They were good, although comments were that you were tasting the sauce and not really the meatball. I really liked that the meatballs were irregularly shaped, like they were handmade instead of spit out of a machine. We all liked the stew. For such a simple recipe, it was very good and flavorful. Some thought the chicken sausage was overpowered with fennel but admitted that in combination with the other stew ingredients, it worked really well. Do you want to try some yourself? 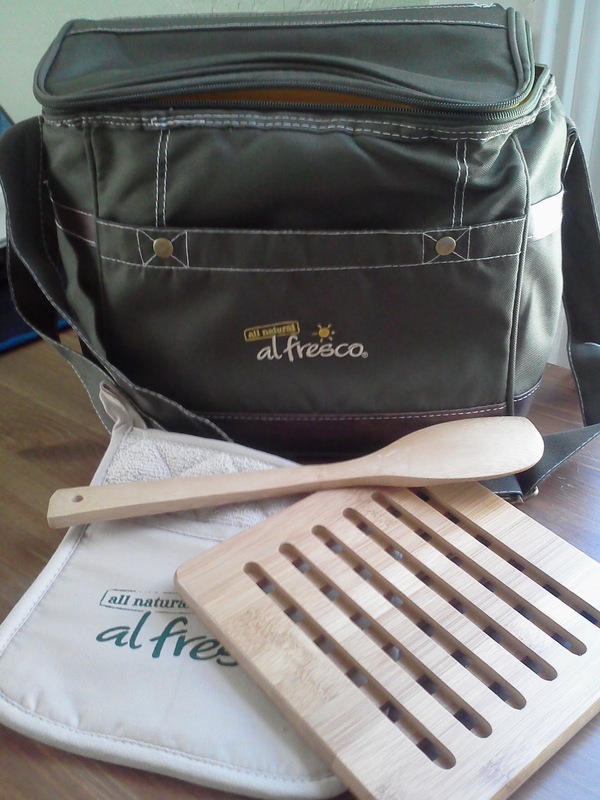 Then enter the contest to win this al fresco picnic/cooler bag with trivet (w/ bottle dividers and opener), wooden spoon, and hot pad, plus coupons for free samples. Scroll down below the recipe to enter. Slice sausages on the diagonal into 1/2" pieces. Cook sausage and garlic in a large nonstick skillet over medium high heat until browned. Bring to a boil, lower heat, cover and simmer for about 10 minutes until carrots are tender. Optional: May be served with fresh grated Parmesan cheese. AND THE WINNER IS: MANDA!